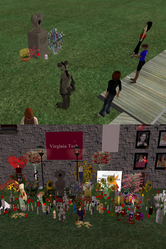 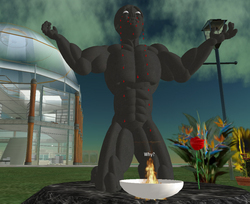 This is one of a series of screen grabs I collected of the VT memorial on Kula Island in Secondlife.com hosted by Buridan Simon. 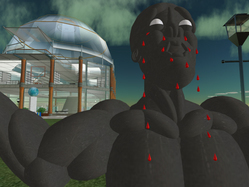 This is one of a series of screen grabs I collected of the VT memorial on Kula Island in Secondlife.com hosted by Buridan Simon. 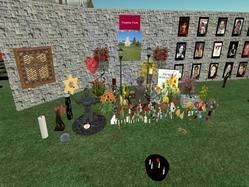 This picture includes Hilde, CT (me) and Shakti. 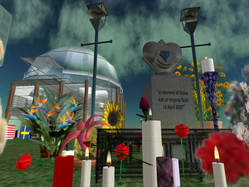 This is one of a series of screen grabs I collected of the VT memorial on Kula Island in Secondlife.com hosted by Buridan Simon. 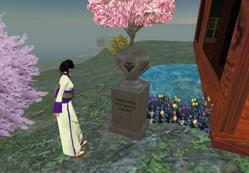 Shakti Burks plays a memorial tune.